Hurricane Gustav Update. 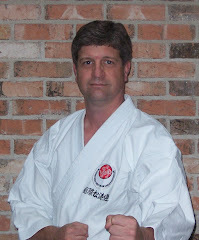 Today, Thursday, Sept. 4th we will reopen for Karate at the dojo. We had some minor damage to the glass framing and a little water incursion, but everything else seems to be fine. Here are some pictures of the dojo before and after the storm. Special thanks to Bobby Vincent, David Jeffreys and Steve Bellingham for the assist in boarding up and boarding down the dojo. I hope to see everyone at the dojo tonight. SPECIAL NOTE AS OF FRIDAY, SEPTEMBER 5, 2008. 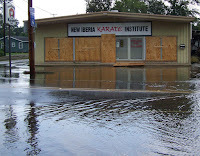 Please note that there will be no Karate classes on Saturday September 6, 2008 due to continuing clean up efforts. We had quite a small but spirited group last night (Thurday). Classes resume as normal on Monday, September 8, 2008. Thanks for all the kind notes and comments.